The Indian coach Ravi Shastri has said that India could send Virat Kohli at no. 4 to protect him in big matches at the World Cup. He further added that the team would not want to lose their best batsmen early on. “You don’t want to be 18-3 or 16-4 in a big tournament. I don’t care about bilateral ODIs, but why should I lose my best batsman early in a World Cup match (if the conditions are bowler friendly),” he said. Shastri also praised the Indian openers Rohit Sharma and Shikhar Dhawan and said that the two are best ODI opening pair at the moment. “The top-order is a big factor for India in ODIs. Dhawan and Rohit are one of the best ODI opening pairs at the moment,” he said. “I think the left-right combination really helps them. Look at the speed with which Dhawan has got 5000 ODI runs. Look at Rohit’s record, three ODI double hundreds, did we even think that was possible? When they finish, I think they will be comparable to Sachin Tendulkar-Sourav Ganguly – India’s best opening pair in ODIs, or even Matthew Hayden-Adam Gilchrist (Australia) and Gordon Greenidge-Desmond Haynes (West Indies). They are big game players,” he added. Speaking on MS Dhoni’s position in the team, Shastri said that the experience of the former skipper will be useful to the Indian team at the World Cup. “He is still a great batsman and is finishing matches for us. You saw in Adelaide, and he has been in terrific form this year. He may not be Dhoni of 2008 or 2011. But experience is not bought or sold in the market,” Shastri said. Speaking on Dhoni’s keeping abilities, Shastri recalled Jimmy Neesham’s run out in the 5th ODI between India and New Zealand. “That was Dhoni at his very best, like a con artist. He was not even looking at the ball, and the run-out was done in a flash, and it changed the course of that game,” he said. “He is superb with the gloves, and from behind the stumps he really guides the wrist spinners because he understands all the fielding angles from inside the circle much better than the others,” Shastri added. Talking about India’s newfound pair of wrist spinners, Kuldeep Yadav and Yuzvendra Chahal, Shastri said that India were looking for bowlers who can get wickets in the middle overs, which the two have done successfully.”And the biggest thing is Kuldeep and Chahal have gelled together as a pair. They can go for runs, and they will at certain times, but they give us wickets in the middle overs,” he said. 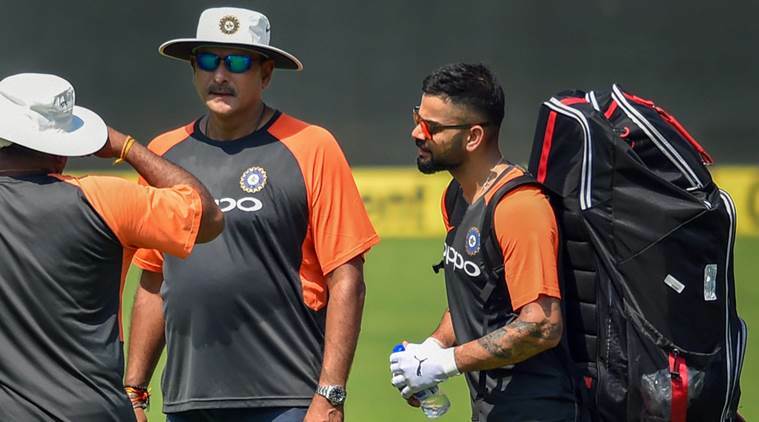 Despite questions being raised on India’s middle order, Shastri insisted that the presence of Ambati Rayudu, Hardik Pandya and Kedar Jadhav has eased the trouble. “In the previous match (fourth ODI at Hamilton), he (Rayudu) batted like a millionaire (throwing away his wicket as India were bowled out for 92). He went back to the drawing board after that, and dug deep on Sunday in Wellington. He played the situation,” he said. “And the one quality Rayudu has, he can be very unorthodox. With the way he bats, he can be an x-factor for us. He will play shots that are unconventional at times, but they can be very effective. The more he plays like this (like at Wellington), the more he will realise he can do that to the opposition,” Shastri added. Talking about Pandya, Dhoni and Jadhav as an aggressive unit down the order, Shastri said: “This aggressive intent adds flair to the Indian side. The best ODI sides in the world have proper batsmen at numbers 5, 6, 7, 8. Look at the Indian team in 1983, or even in 1985. Then, look at the 2011 Indian team. You had Suresh Raina coming in at number seven, and he won you games (against Australia in the quarter-final and Pakistan in the semi-final). With Yuvraj Singh, MS Dhoni and Raina at numbers 5, 6, 7, no side could relax. So when you have Hardik Pandya coming in at number 7 or even at 8, the opposition cannot relax,” he added.